Life comes with so many questions. Many of which are up to those who major in biology to answer. Biology is, quite literally, the study of life. And you want to devote your life to studying life. Well, get your lab coat, goggles, and notebooks ready: You’re about to dissect the facts about different biology majors. Find a biology program near you. Biology is an extremely diverse field that studies every single living thing on the planet—anything from the tiniest bacteria on up through the largest creature, on the land, in the sea, and in the air. Careers range from an associate degree through a Ph.D. The common denominator for all professionals with a background in biology is that they hold a degree in, try to guess it, biology. One of the most repeated questions when it comes to biology degrees is, “What the heck can you do with a degree in biology?” Well now, that’s a loaded question if ever there was one. There are so many careers that can be obtained when you have your biology degree that it would take quite a while to list them all. One of the most popular paths for those going into biology is research. Whether you’re in the field studying primates or underwater evaluating coral reefs, you have a background in biology. Chances are, you’re drawn to one primary aspect of biology and will end up dedicating most of your career to it. Who knows, maybe it will be you who helps discover the key to life or a cure to the common cold. 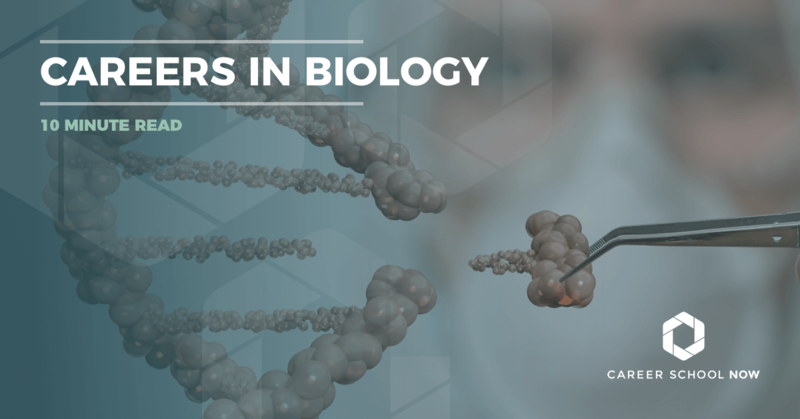 Depending on your course and your passion, your career in biology may take you to the far recesses of the world doing research, imparting your wisdom to a classroom filled with minds to be molded, or working in a lab as part of a team of researchers. So, if you’re still wondering what career options a degree in biology will open up to you, then just know you will be able to do many different things in many different locations. If you’re going to school for a degree in biology, you have quite a lot (actually, an overwhelming amount) of options. The same goes for the actual degree type. Biology degrees come in every size and shape, from a certificate up through the highest of doctorates. All you need to know is what you want to do and where you want to end up. Regardless of what degree you want, when you’re majoring in any type of science, you can expect a course load filled with lectures, labs, and field work. If you’re in high school and know that you’ll be headed into biology, then there are some things you can do in advance to prepare. Take all the math and science courses you can get your hands on. Also, it wouldn’t hurt to get a job in a veterinarian clinic, or work as an intern in a lab, or clock in anywhere else biologists work. The more you know and understand prior to beginning college, the better foundation you’ll have. Associate Degree: An associate degree in biology will take you approximately two years to complete if you’re attending school full time. Mostly, the careers you will be able to step into are technician careers, but the course credits and work experience will transfer should you decide to get your bachelor’s degree in biology (or beyond!). Popular careers for biology majors are: biology technician, medical or clinical lab technician, forensic science, and forest or conservation technician. As with any associate degree program, you’ll need to first have your high school diploma or GED before beginning your studies. Depending on where you go, you may need your ACT or SAT scores to get accepted into the college. Much of an associate degree program is built around the idea that students will transfer to four-year programs. However, you’ll still have plenty of job options and opportunities with a two-year degree. Bachelor’s Degree: Getting into a university, there are different requirements based on each school. You’ll need your high school diploma or GED, plus your ACT and/or SAT scores for acceptance (not to mention doing the whole application process, etc). Once you start your college education, you’ll be taking are chemistry, ecology, botany, biology, and so many other science-related courses. You also may end up picking out your specialty based on the area of study you enjoy the most. This may take you four to five years. A side note: The more lab experience you have during your education, the easier it may be to find a job once you graduate. With a bachelor’s degree in biology, you’ll be fully equipped to lead research teams, conduct experiments, teach, and find jobs in the medical field. Should you decide to go even further with your education, there are master’s degrees and Ph.D.s out there, just waiting for you. Because there are so many different career options within the field of biology, it would make for a very long and exhaustive list. Basically, biology is sectioned off into topics and fields of specialities fall under these. Topics are animal, human, marine, molecular, and computational. Research: You’re curious. You’re stubborn. You need to know, you need to discover, and you need to help. Take that biology degree and go do research. Use your superpowers for the greater good. Medical: When you consider biology as the study of life, many think about humans first. There are so many varied careers in the medical field. Doctors, nurses, technicians, physical therapists, or any job that needs working knowledge of the human body inside and out, would have to study or major in biology. Animal Science: Our furry, scaly, feathered, and hairy friends that inhabit the earth, sea, and sky all are under the animal science category in biology. Careers include marine biology, zoology, veterinarian, vet tech, and wildlife biology, to name a few. Education: You love everything about biology, and your enthusiasm is infectious: You may be perfect in education. Become a biology teacher and lead your students to discover why you love this science so much. Once you get a bachelor’s degree, you’ll have to get licensed to teach. Plants: Plants are living organisms, and they are as interesting as humans to many biologists. Soil science, horticulture, and botany are just a few main career paths for biologists interested in plants. Molecular: Study all the molecules that make up organisms, as in, DNA and the effects of mutations and sequencing. You’ll analyze diseases and medicine and how they react to each other. Basically, you can find the next big cure. Biology Technician: Biology technicians usually work as part of a team in a lab doing research and experiments. You may be able to find a job with an associate degree, but it might prove easier if you get a bachelor’s degree. A 10 percent job growth is expected between now and 2026, with the median annual salary coming in at around $43K. Genetic Counselor: Every body tells a story, literally. And genetic counselors are there to discover what heritable traits a person carries, and the potential these have to affect them. To be a genetic counselor, you’ll need a master’s degree. Job growth is expected to be 28 percent through the next few years, with the average salary at over $77K. Physician’s Assistant: Physician’s assistants hold master’s degrees and have the same type of responsibilities as a physician. However, PAs do not have complete autonomy; they work directly under the doctors they are employed with. Through the next few years, there is a 37 percent employment growth expected. Physician assistants earn an average salary of over $104K. Nurse Practitioner: At the very minimum, nurse practitioners need a master’s degree. However, they first start out as an RN, which is another great career for biology majors. You’ll only need an associate degree to start. Nurse practitioners are highly trained, and in some states are allowed complete autonomy, similar to a physician. The job outlook for all nurse practitioners, including specialties, is 31 percent. The average salary is over $107K. Wildlife Biologist: Animal lovers who adore biology are sure to flock toward careers in wildlife biology or zoology. Studying animals, how they interact with their environment, their behaviors, their characteristics, and the impact they have on humans is all in a day’s work. Bachelor’s degrees are perfect for entry level positions, but if you want to do investigative, scientific, or independent research work, then master’s degrees through Ph.D.s are necessary. Employment growth is about average for the next few years, and the median salary is over $62K. Microbiologist: The median salary for microbiologists is over $69K, and employment growth is expected to be very average. Microorganisms are under observation by microbiologists in order to study how they grow, live, and interact with their environment. A bachelor’s degree is needed for entry level positions. Environmental Science: Environmental scientists and specialists are superheroes who use their vast knowledge of the environment to protect it and the life that inhabits the earth. With a bachelor’s degree, you’ll be able to get an entry level job, where you’ll earn an average of $69K. No worries about a job shortage: The employment outlook is 11 percent through the next few years. Occupational Health and Safety: These specialists analyze work environments and procedures to ensure employees safety. With a bachelor’s degree as the minimum requirement for an entry level position, you’ll earn an average of over $71K annually. Pharmacy Technician: Pharmacy technicians are usually trained on the job. They earn an average salary of just over $31K. Job employment is expected to grow around 12 percent through 2026. Pharmacy technicians need a high school diploma or GED before they are allowed to dispense medication and help pharmacy customers or other health professionals. Veterinary Technician: Associate degrees are required of vet techs. Vet technologists have to have a bachelor’s degree. Both work under the supervision of a licensed veterinarian. Employment growth is at 20 percent through 2026, and the average salary for a vet tech is $33K. Scatologist: This is the study of poop. By studying the excrement of animals, you’ll be able to learn many things from their habits to their health. Biological Illustrator: This cool and often lucrative career melds art and science. Biological illustrators create drawings or paintings to demonstrate the subject for others to use as a learning tool. Venom Milker: This unusual job is not for the faint of heart. Scientists that study snake venom often have to obtain their samples themselves, meaning they have to force often extremely poisonous snakes to excrete their venom without getting themselves killed in the process. Getting bitten is par for the course, however. Science Copywriting/Technical Writing: You know your science, and you love writing. Combine the two and write copy for anything from marketing products to technical manuals. There are hundreds of different types of careers under the header of “biology.” No matter what your degree path is, your love of biology will help you find your place among like minded biology professionals.